Uttarakhand Latest govt jobs recruitment 14913 Sarkari Naukri notification for 10th, ITI, Diploma, Graduate and 12th pass government jobs in Uttarakhand 2019. The job seeker who is searching job vacancies in government department of Uttarakhand can find all updated job posts here on this page. Candidates if you are preparing for examination like UKPSC, Uttarakhand Police, Electricity department, District courts, High court law jobs in Uttarakhand can have a look at all upcoming and latest Uttarakhand jobs in 2019-20. Aspirants wanted to apply online job application form for various vacancies released recently can check the list of all central and Uttarakhand state govt jobs near you. Candidates who are looking for upcoming Uttarakhand Sarkari jobs notification can get details about posts before it gets released. By getting all the information related to forthcoming vacancies applicants can plan & prepare for the job opportunity. Also, job seekers searching for any particular examination or specific department job post can save our page, by doing that you will get all Uttarakhand upcoming jobs notice and other details as soon as it gets released. Good news for Candidates who have completed (12th class/ Higher Secondary School Certificate) as you are now eligible for 12th pass government jobs in Uttarakhand 2019. Govt Depts are offering jobs in Uttarakhand for 12th pass. 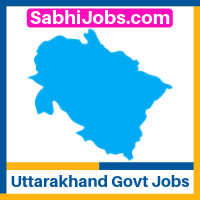 you can check all government jobs in Uttarakhand 2019 for 12th pass on our website sabhijobs.com by one click, so just go to 12th pass based jobs page search all available jobs and if your profile is matching with recruiter requirements then go ahead and apply for the post. The job seeker who has completed their graduation in engineering and looking for a job vacancy in Engineering line can get all government jobs notification. All types like mechanical, ECE and IT jobs in Uttarakhand or if you are from other trades like Production, Chemical or civil engineering jobs in Uttarakhand for freshers and experienced candidates. Many job posts notices are being released by various central and state government departments in Uttarakhand, so if you wanted to join any government department as an engineer or looking for faculty jobs in engineering colleges in Uttarakhand can check the available posts and apply now. Aspirants who want to start their career with teaching line can check the list of current job vacancies from the above table. If you are looking to grab a post in any university or college then you can try for the professor or assistant professor jobs in Uttarakhand 2019. Candidates who want teaching jobs in Uttarakhand schools also have a huge opportunity as many private and government school hire teaching and non-teaching staff every year. Apart from Teachers and Professors in government organization applicants can also try in private institutes for lecturer jobs in Uttarakhand 2019. Every year public Banks in India releases various vacancies to fill the posts like PO, SO, clerk and many other vacancies. If you are looking government jobs for graduates in Uttarakhand then banking jobs are the best option to apply online application form. To Get free jobs alert for bank jobs in Uttarakhand latest for freshers and experienced you can bookmark our page, you can subscribe our website via platforms like Facebook and emails then we will start sending job alerts for banking jobs 2019. So to stay connected with us and subscribe so whenever bank jobs notification will release you will get notified. People from Uttarakhand looking for Nursing jobs in Uttarakhand 2019 to apply application can check this page on a regular basis to get free jobs alert in Uttarakhand. We are updating all permanent and contract basis jobs in Uttarakhand notification 2019 here. So no matter if you are from any city or village, you can visit this page anytime and get anm jobs in Uttarakhand Recruitment details. Avoid the last minute tension of filling application stay updated with us by just checking this page on a daily basis as all vacancies on www Uttarakhand govt jobs recruitment com are available here on this page. As you know there are many tourist places in Uttarakhand, So if you are looking for Uttarakhand tourism jobs 2019-20 then you must visit the career page of Uttarakhand Tourism Development Board Office recruitment. They are recruiting various vacancies and releasing the notification on their official website. You can see all the available vacancies by visiting the recruitment page on the official website and open the career page. As we stated above the Uttarakhand is tourist place so another option to start your career with Hotel jobs Uttarakhand. Aspirants who are looking for private or Uttarakhand government jobs for graduates, 12th pass, Diploma can check the vacancies in Hotels. Most of the Hotels require good staff to serve their customer, so if you have a diploma or degree in hotel management then you are good to join Hotel jobs in Uttarakhand. Not only govt job vacancies, even if looking for private jobs in Uttarakhand you have multiple options with you. Candidates can check private bank jobs in Uttarakhand is a good opportunity for a job seeker who wanted to start there career by joining the banking sector job. Multiple private Banks like ICICI, HDFC, AXIS bank releases recruitment notification to hire fresher and experienced candidates in Uttarakhand. Apart from banks, many other organizations like universities, Colleges and schools offers Private jobs for teaching and non-teaching like library jobs in Uttarakhand you can try Uttarakhand olx jobs. If you are still not fine to join above-mentioned jobs then also many other options are available like hr jobs in Uttarakhand in private industry you can always check private jobs in Uttarakhand 2019 near you. Chhattisgarh full time or part time social work jobs in Uttarakhand for freshers and experienced candidates can try jobs in residential schools in Uttarakhand also.